The painting is part of ‘The Leavers’ – the artist’s second solo exhibition at Galerie Quynh. 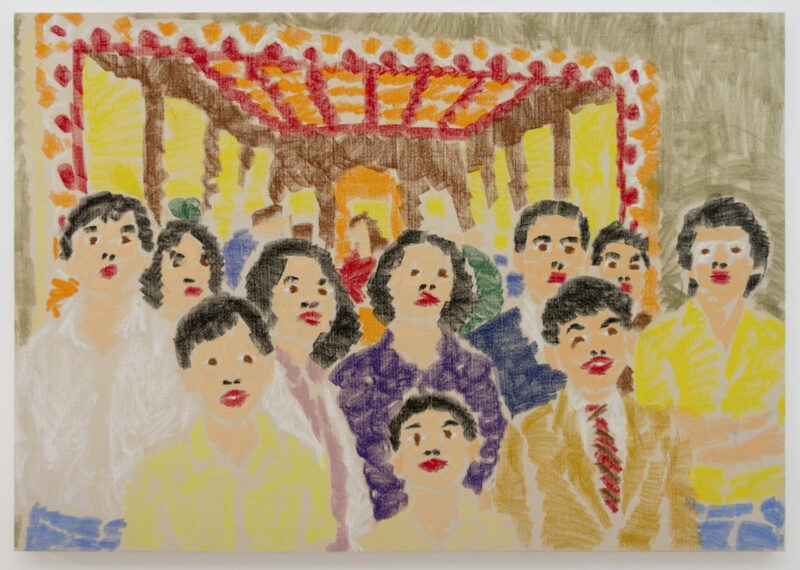 Nguyen exhibited a series of paintings informed by the artist’s ongoing film project, DONG, an exploration of family history through the imperfect lens of memory. The colorful and playful paintings belie a deep reflection on history, culture, and the psyche of those uprooted and transplanted to foreign lands. Sourced from old family photographs, the paintings depict coloring book images that have been filled in but with the black outlines removed, suggesting the skewed ways in which we remember, shape, and colorize the past. Nguyen asks of the viewer to mentally redraw the missing lines, to give definition to this fuzz. Employing oil pastels, a medium that never fully dries, Nguyen reiterates how memory is organic and ever shifting.